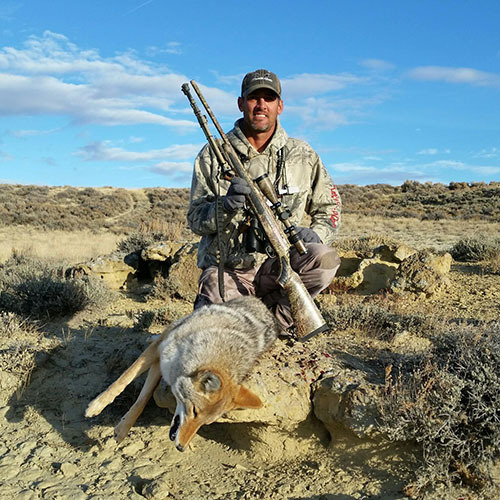 When famed coyote caller Les Johnson teamed up with Burris Optics, the quest was to create a riflescope that excelled at his lifelong passion: predator hunting. The Predator Quest® series of scopes allows anyone to be involved in the same passion, with the same equipment. Les was looking for exceptional light gathering ability, since he's frequently in the fields when daylight is failing. Burris used the patented HiLume multi coating glass recipe, which transmits more light through the scope. Les knows that any glint or reflection from a scope can scare off a predator. Burris created an Anti-Reflective Device (ARD) that eliminates those stray light rays. Les demanded a reticle that was quick to use in the field, but still provided the long-range accuracy he needed. Burris had the perfect solution: the Ballistic Plex E1 reticle. This reticle makes it easy to adjust for both distance and wind, and features trajectory compensation out to 500 yards: perfect for loping coyotes. Les also asked for a camouflage option so Burris wrapped some of the Predator Quest scopes in Realtree Max-1® Camo. Les Johnson has been on a quest since childhood, a quest that has honed his skills as an outdoorsman and given him a rich life pursuing his true passion – predator hunting. Raised on a south-central Nebraska farm, Les spent his youth hunting, fishing, and running bank lines. Trapping with his grandfather first introduced him to coyotes and gave shape to his quest to best the cunning creature. In 1999, Les launched himself into the top ranks of the sport by securing the Triple Crown Championship. As the first and only coyote caller to win all three major championships (Midwest, National and World Championships), let alone the first and only to win all three in the same year, Les secured his place in coyote-calling history. Predator Quest, his long running television show, won "Viewer Favorite Hunting Show" in 2009. It can be seen on the Pursuit Channel.